Your vacation should be a dream come true. 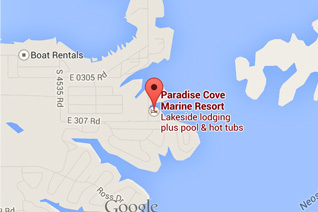 Surrounded in lakefront majesty, Paradise Cove Marine Resort is the perfect place for your dream vacation. From cottage to condo, we're your total vacation destination! Truly the finest accommodations available on Grand Lake. With nightly and weekly lodging. If you are organizing your corporate retreat, family reunion, or just an escape to the lake, our setting will assure peace of mind. Each unit complete with all the amenities you could ask for!